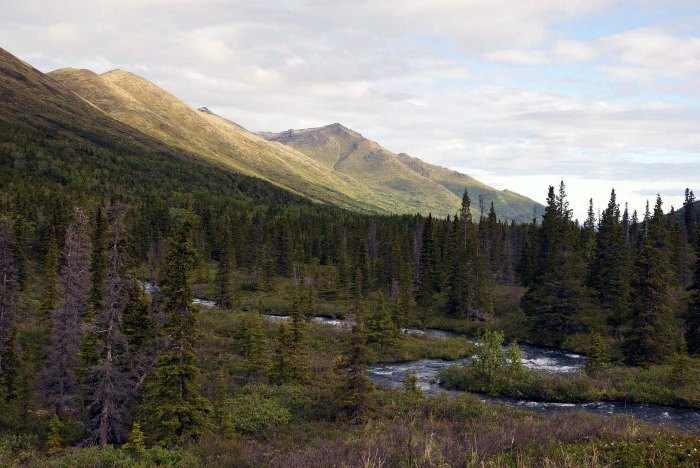 The Eagle River area, just north of Anchorage, has some of the best hikes in Alaska. 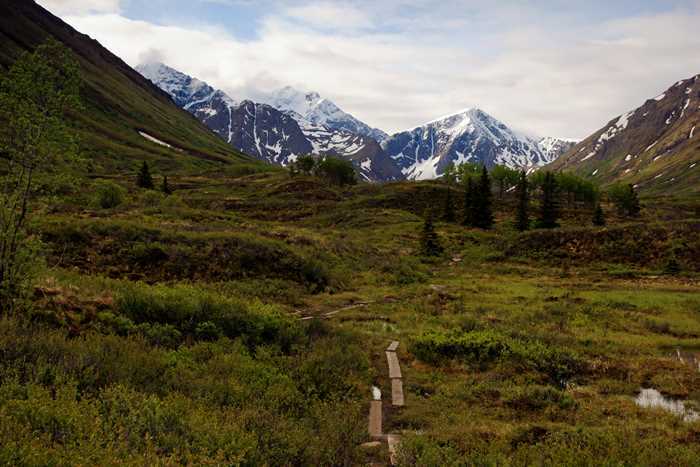 And I don’t think you can find a more idyllic trail than the path out to Eagle and Symphony Lakes. 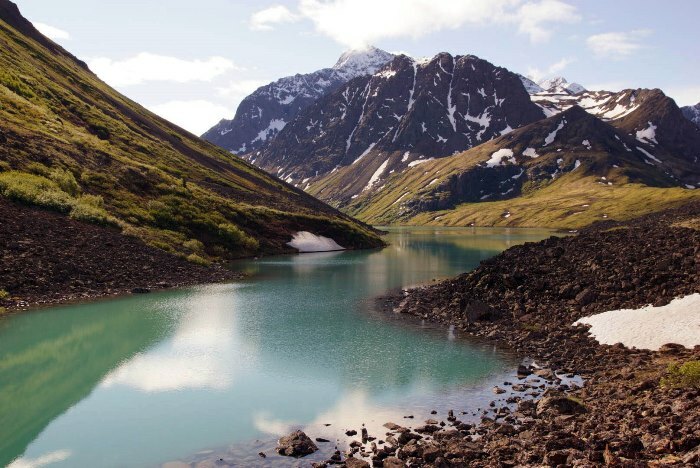 It’s about a 12 mile round-trip, but it’s a pretty easy hike, surrounded by mountains, leading to two beautiful lakes — one glacier-fed and minty-green, the other a crystal-clear blue. And even though it’s a long hike, you can knock it out in just a few hours, as I did, on the morning before my flight home. 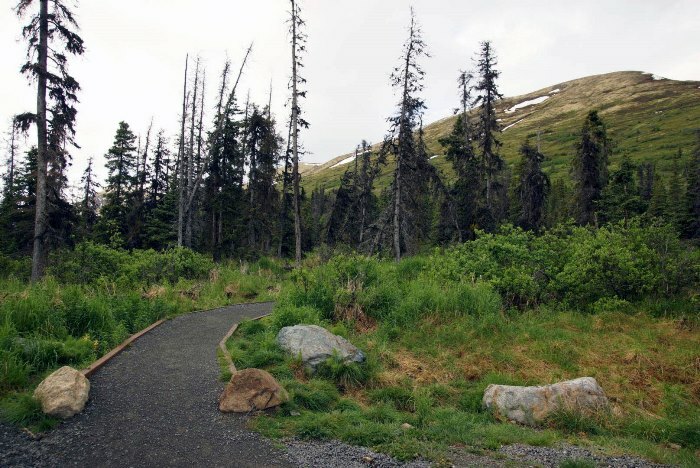 You can access the trail to Eagle and Symphony Lakes from the Upper South Fork Eagle River Trailhead in Chugach State Park. 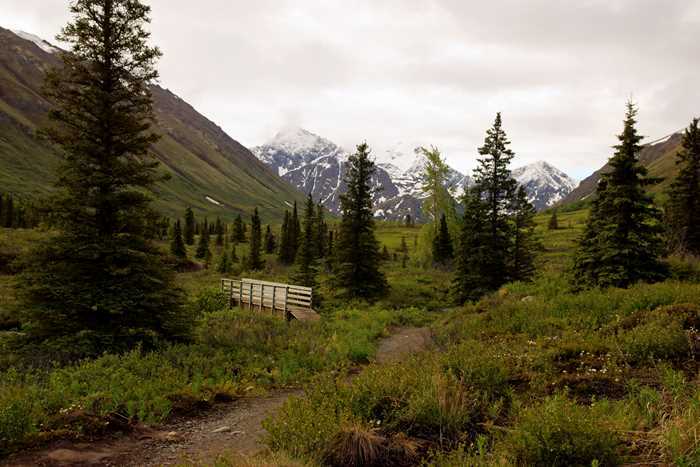 To locate this trailhead, from Eagle River, take Hiland Road for 7.1 miles, then turn left on Creek Road, cross the creek, then turn right on River Drive. The trailhead will be on your left. 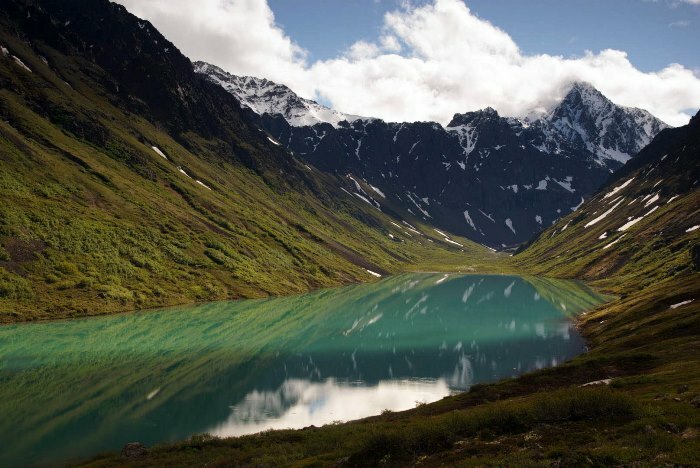 Can you imagine a more perfect Alaskan scene? 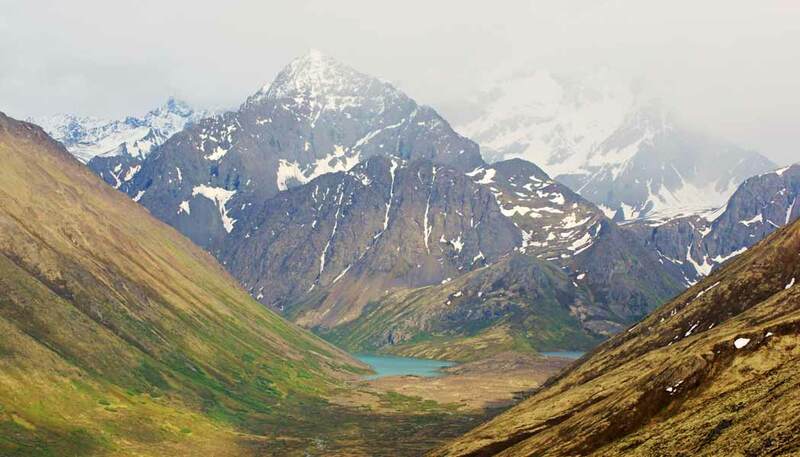 This is the view from the Rendezvous Peak trail, and on the final day of my 2015 trip to Alaska, I was huffing and puffing to make it up to the mountaintop, all while admiring this beautiful valley. I really wanted to hike out to those lakes. But on that trip, I went straight from the Rendezvous Peak trail to the airport — muddy boots and all. And then, I spent a year thinking about that trail, that valley, those beautiful peaks, and the gorgeous lakes. Fast forward a year. It’s 2016 and I’m in Alaska once again. I had several potential opportunities to do this hike, but nothing seemed to work out. Time was ticking away. I was down to my last day — with a late evening flight out of Anchorage. Either it was going to happen, or I’d regret the missed opportunity for another year. I got up early that final day of my trip (starting what would eventually be a 36-hour day). I’d say it was before dawn, but in late spring in Alaska, there’s no such thing — the sun is barely down when it comes up again. But it was still early. I got to the trailhead around 7 a.m. I wasn’t the first one there — a couple of locals were starting their day with a jog on the first portion of the trail. It sure beats the hiking trail near my house — the trail that follows a drainage canal to the sewer treatment plant. Yes, this trail is much, much better. … as it skirts the slopes of the hills on the west side of the valley. One of those hills is Rendezvous Peak — the mountain I had climbed on my final vacation day, a year earlier. There appear to be a couple of paths up to Rendezvous Peak — and I’m not sure if, the previous year, I took the best one. 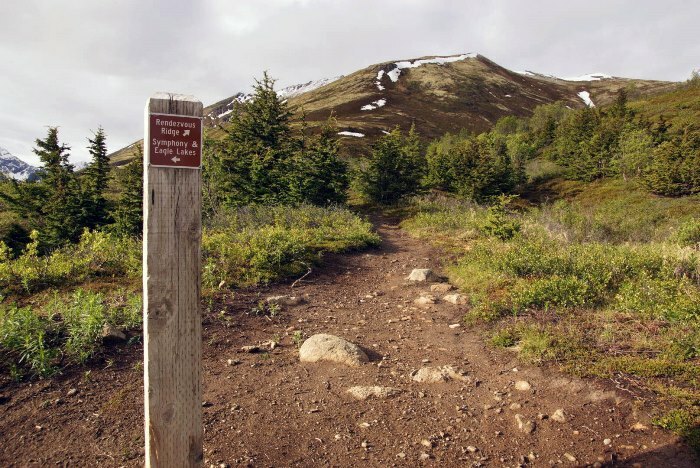 The trail that’s actually signed as Rendezvous Ridge is about 30 minutes down the trail. 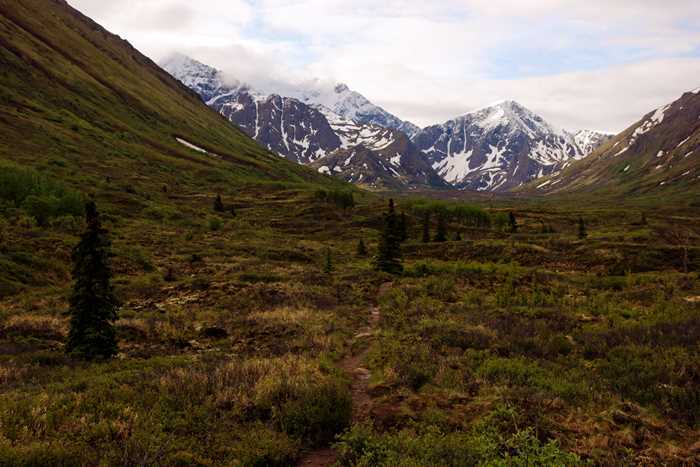 After the Rendezvous Ridge trail splits off, the main trail drops down to the bottom of the valley, towards the South Fork of the Eagle River. Here, you’ll find the first of two bridges. Once you’ve crossed the bridge, you’re entering public land. Before the bridge, the trail is surrounded by privately-owned property. 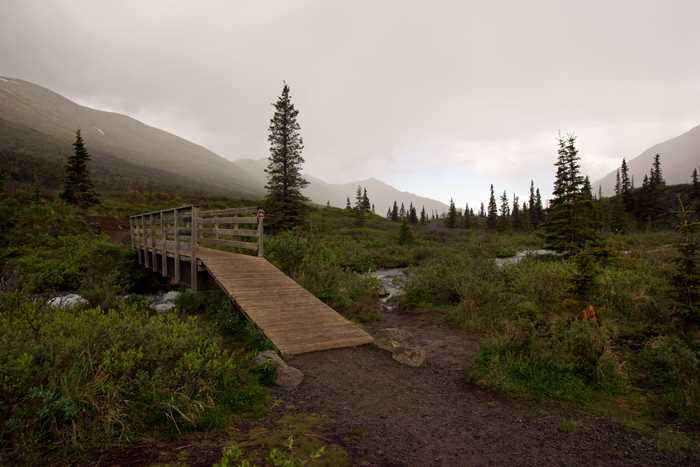 Shortly after you cross the first bridge, you might notice a side trail that splits off to the left. This trail takes you into Hanging Valley. 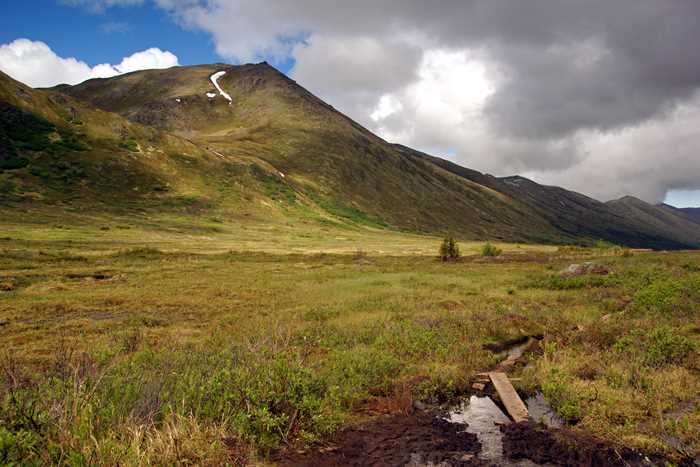 I’ve read that the trail is faint at times, but once you get into the valley, you can climb up to a nice viewpoint, or just generally explore the area. It might be a good option if you still have plenty of energy and time as you return from Eagle and Symphony Lakes. The trail gets interesting, after you cross the bridge, for a few reasons. 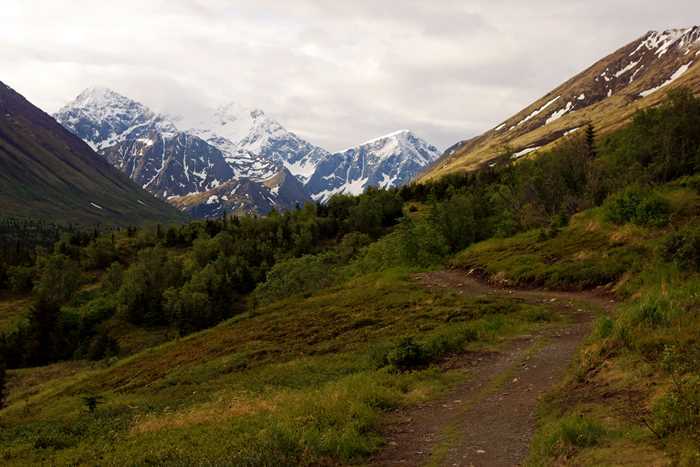 For one, you’re getting closer to the mountain peaks up ahead. The views keep getting better, but the trail gets worse. Notice that pond/puddle? It’s great for catching some reflections of the surrounding mountains, but it also reveals something important about this trail. There isn’t much of an elevation difference between the pond and the trail. And that means? Mud. Lots and lots of mud. Oh, so much mud. Sure, someone tried to help the situation by laying down some boards. And the boards do help, somewhat, in a few very critical areas. But all too often, the boards end, right in the middle of a mud bog. You know, something that looks like this. I had soaked my spare pair of shoes the previous night, when one leg plunged into a stream. I was wearing my only other pair — and I wondered how on earth I’d get them clean enough to wear onto the airplane. There are some alternate trails that have been blazed through the brush, which help to get around some of the muddiest spots. Sometimes, though, these newer paths also lead to puddles, and sometimes they simply dead-end. It’s the only thing that’s bad about this otherwise perfect trail. If you can ignore the mud, the scenery will amaze you. My early morning arrival time provided some blue skies, with just a few clouds thrown in for character. Another pond provided more great reflections. Oftentimes, the wind is more still in the early morning, which allows you to capture better reflections. You’re getting close to the second bridge, and the giant rock pile, when you reach this solitary boulder in the middle of the valley. 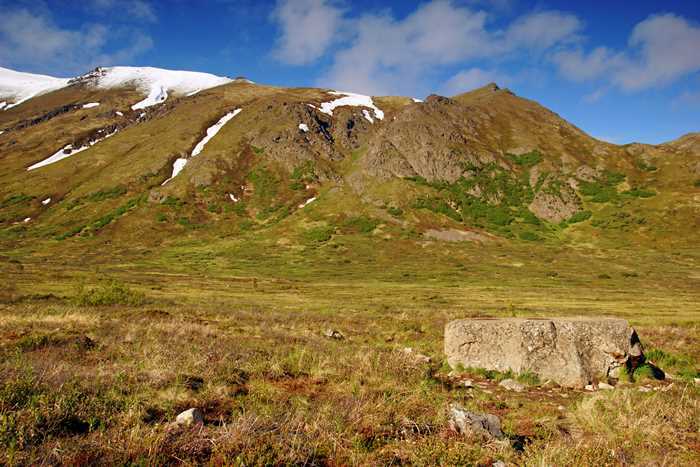 No doubt, it was dropped here by a glacier, decades or centuries ago. 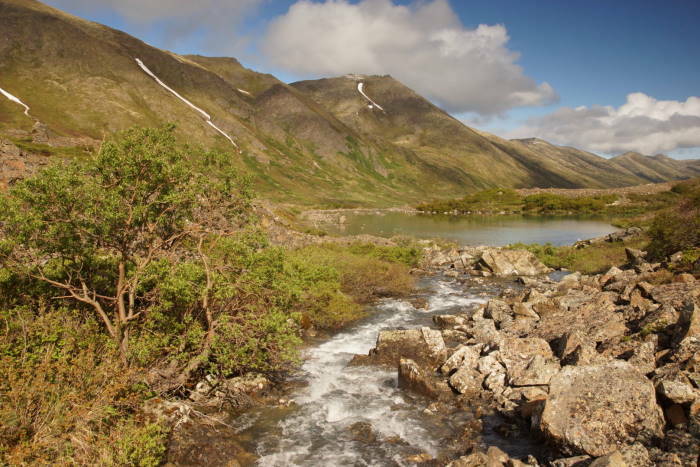 … at the outlet to Eagle Lake (the larger of the two lakes, and also the one that is glacier-fed). 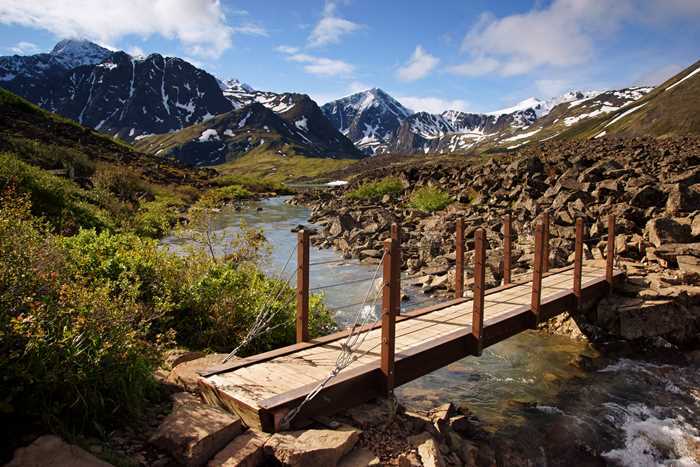 Cross the bridge, and you’re on the huge ridge that separates the two lakes, made of glacial boulders. From here on, you’ll be rock-hopping instead of hiking. I made my way down to the edge of Eagle Lake. At this time of day, the sun had made its way from the northern sky into the east — which meant I was facing the sun and the mountains. This angle isn’t great for photography, so the pictures taken in that direction look somewhat washed-out. 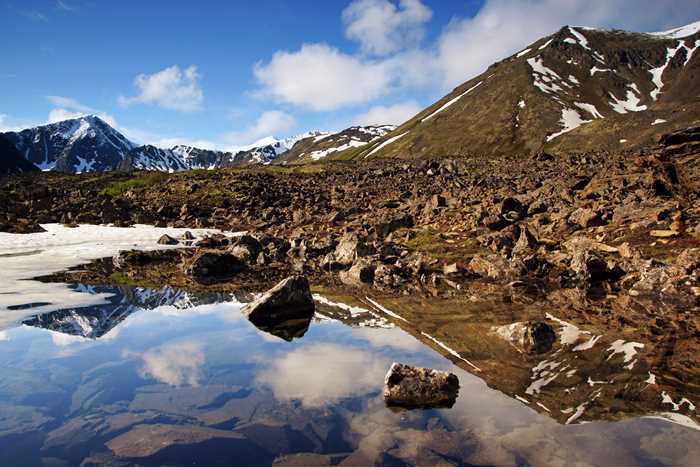 In the middle of the rock pile, I found a small pond, which was still partially frozen — in early June. 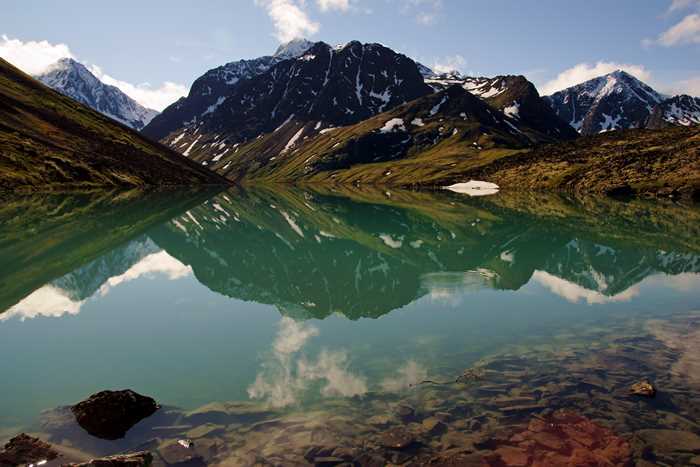 The unfrozen parts provided more good reflections of the mountains. 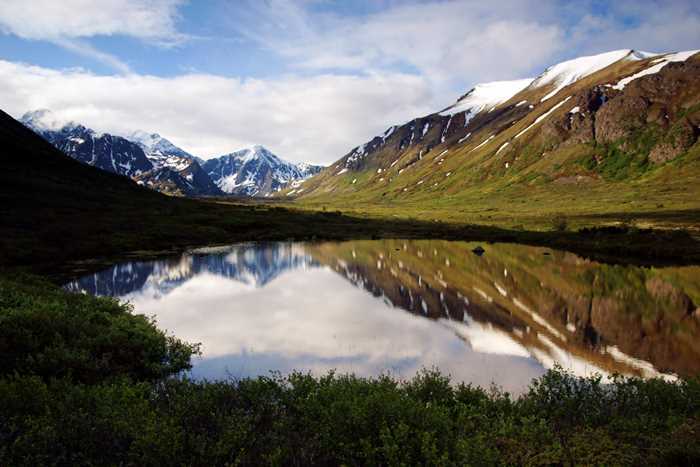 … all I could see was the reflection of the valley that surrounds it. 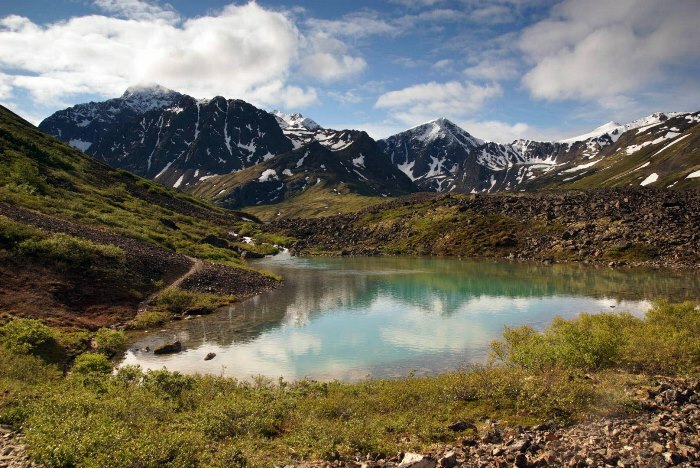 Trail guides suggest that it’s about 5 miles to the second bridge, and 6 miles to Symphony Lake. After hiking all that way, I wanted to spend some time here, before the return trip. And there’s a great place to hang out! 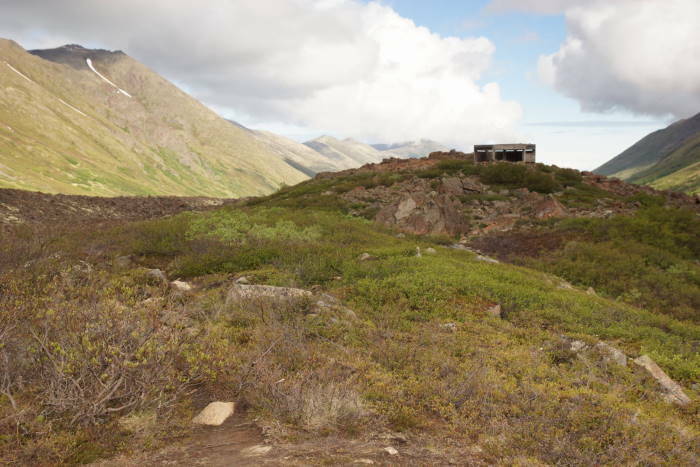 Some time ago, someone built a six-sided hut on the ridge between the two lakes. It appears to be only partially complete — there’s no floor, and only half a ceiling, and a couple of walls are missing. But, those missing walls open out onto a view of the lakes, so that was probably intentional. If it were rainy, the shelter might help you a little. If it were windy, it would be a big help. This picture gives you a good idea of where everything is at. 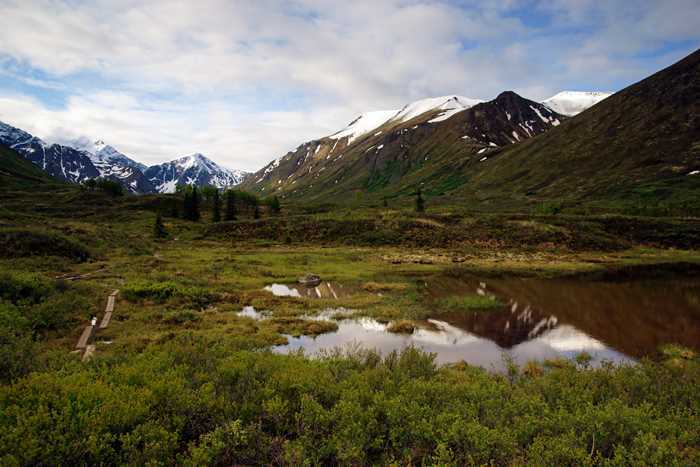 Eagle Lake is on the left, Symphony Lake is on the right. 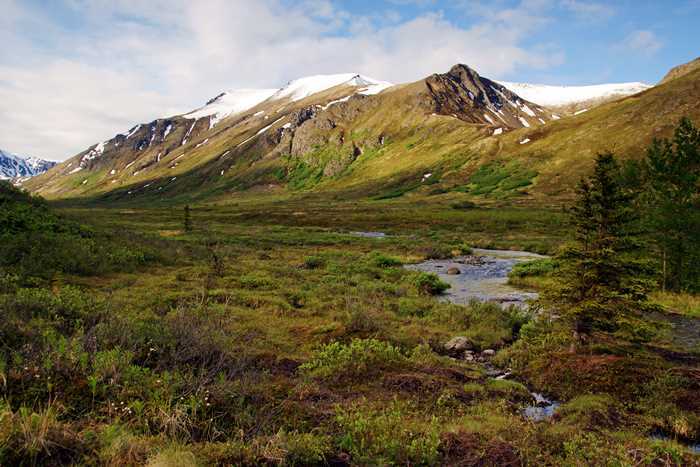 I was satisfied to make this my destination — but you could choose to hike much further. 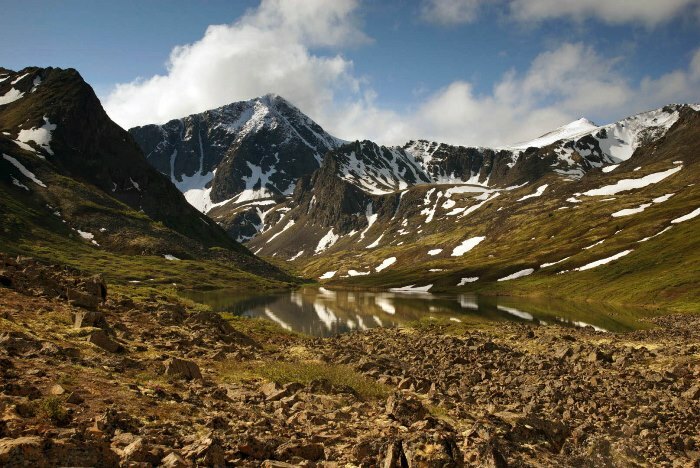 I’ve seen maps that suggest it’s possible to hike all the way around both lakes, and up both valleys. I’ve also read that these extended trails can be even soggier than the mud puddles I encountered. I probably spent about 30 minutes at the hexagon hut. While there, clouds started to roll in, and it felt much colder when I left than when I arrived. The hike out, I soon realized, was going to be less pleasant than the hike in. Shadows were creeping across Eagle Lake, and clouds were gathering around the top of Eagle Peak (the pyramid-shaped mountain positioned directly behind Eagle Lake). 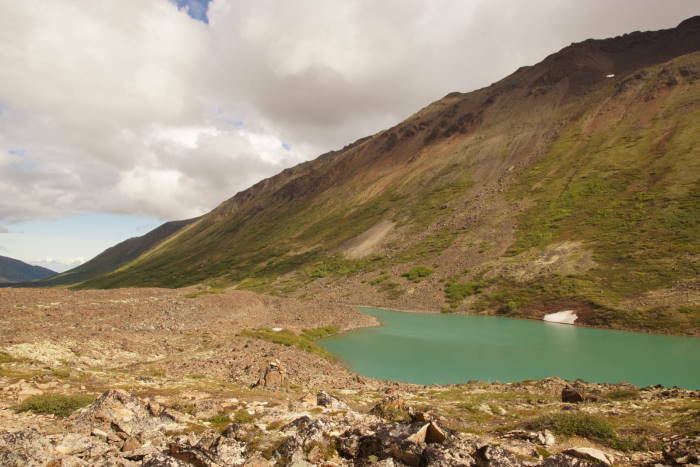 I headed back towards the end of Eagle Lake, to cross the bridge and begin the return hike. It wasn’t until after the bridge that I saw another person — the first human I had seen since those joggers, around 7 a.m. After that, I encountered several more groups of people. All of them were arriving as the weather turned gloomy. I realized that I had been rewarded for starting early — not only with total solitude at the lakes, but also with beautiful weather conditions. No one else on the trail that day got to see what I saw. I did a better job navigating the mud pits on the way back. I began to realize that I might not have to buy a new pair of shoes for the flight home, so long as I continued to be careful. 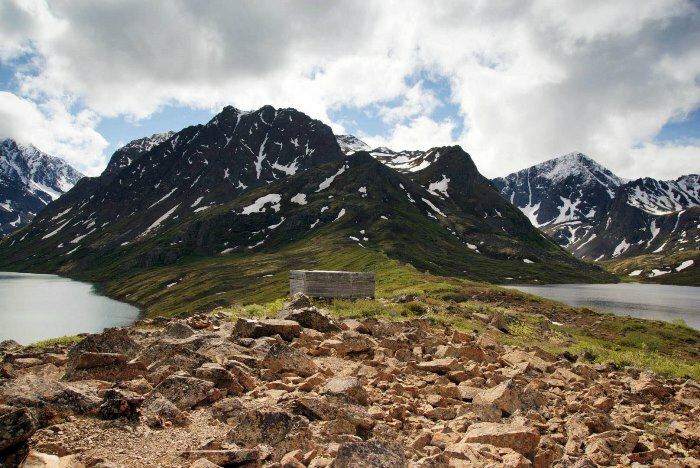 The entire hike to Eagle and Symphony Lakes is about 12 miles, round-trip, but don’t let that big number discourage you. 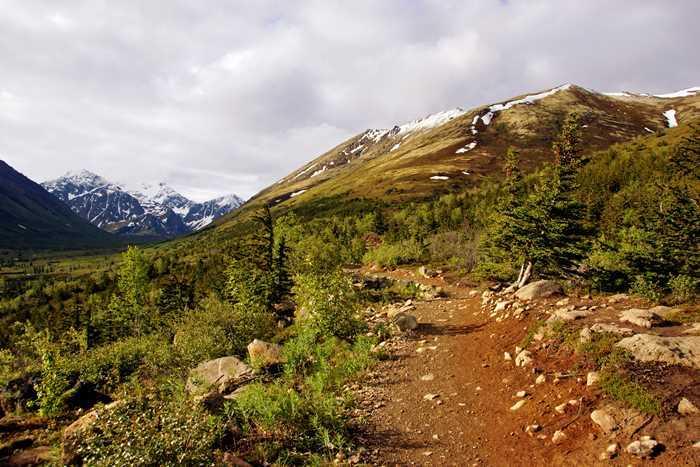 There is very little elevation gain or loss, so you can hike it quickly. 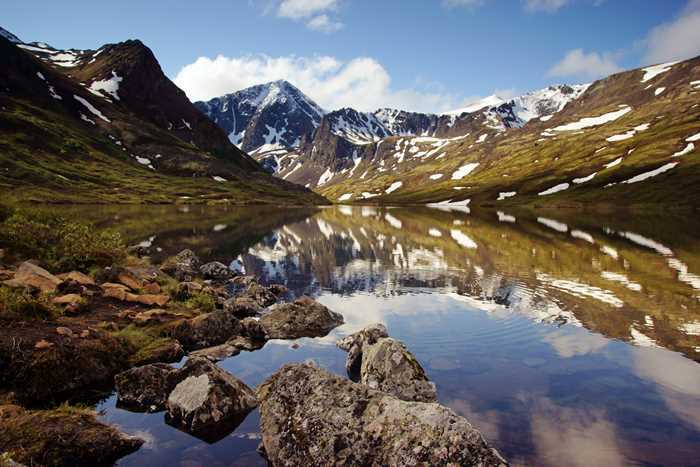 A six-hour round-trip is very possible — with a generous amount of exploring time at the lakes.